The lower rainfall in semi-arid areas compared with that in humid climates does not mean a corresponding low level of soil erosion by water. Indeed rainfall erosion can be higher in semi-arid areas than in any other climatic zone. This is partly because the rainfall of semi-arid areas has a high proportion of convective thunderstorm rain of high intensity and high erosive power. It is also because there is poor protective vegetative cover, especially at the beginning of the rainy season. Some of the soils common in semi-arid areas are particularly vulnerable, either because they have poor resistance to erosion (high erodibility), or because of their chemical and physical properties. An example from Mexico is illustrated in Plate 4.1 For example, alfisols suffer a particularly high loss of productivity per unit loss of soil (Stocking and Peake 1985). Gully erosion can be severe in semi-arid climates and the benefit/cost of gully control needs to be considered. Successful but expensive gully conservation like the Australian example shown in Plate 4.2 might not be suitable for third world countries. There are always strong links between measures for soil conservation and measures for water conservation, and this applies equally in semi-arid areas. Many measures are directed primarily to one or the other, but most contain an element of both. Reduction of surface run-off by structures or by changes in land management will also help to reduce erosion. Similarly, reducing erosion will usually involve preventing splash erosion, or formation of crusts, or breakdown of structure, all of which will increase infiltration, and so help the water conservation. The approach by soil conservationists in the 1980s is moving away from using mechanical works and structures in soil conservation programmes paid for by a government or a donor-funded project. An example is the increasing awareness of the ineffectiveness of terracing programmes alone. Also, we are moving towards the view that the only effective programmes are those which have the full support of the people. The subsistence farmer cannot afford to respond to philosophical or emotional appeals to care for the soil, and this means that conservation measures must have visible short-term benefits to the farmer. For the subsistence farmer the benefit he would most appreciate might be increased yields per unit of land, or perhaps better production per unit of labour, or perhaps improved reliabi- lity of yield. If we accept the argument that soil conservation must be cost- effective to be acceptable to the farmer, then the low value of production from semi-arid soils means that only cheap and simple solutions are appro- priate. On a fertile soil with good rainfall it may be sensible to invest a lot of labour or money in sophisticated schemes for controlling the run- off, but not in semi-arid areas with low and unreliable yields. It follows that attempts to eliminate soil erosion completely may be unrealistic, and that some level of erosion may have to be accepted, and also some risk' of soil conservation measures failing. An example of a realistic approach to the risk of failure are the flood diversion dams built in the People's Democratic Republic of Yemen for spate irrigation schemes. Each end of the diversion is built of stone, or nowadays concrete, with a simple earth centre section. It is accepted that the earth section will be destroyed by big floods but it is cheap to repair or replace (Thomas 1982). To upgrade the design and construction so that they could withstand the 25-year flood would increase the construction effort beyond what the farmers can provide. This same approach should be applied to all mechanical conservation programmes in semi-arid areas. Many conservation programmes have failed because the technology was inappropraite, or misapplied, or because they did not take account of the social situation and did not involve the people. The record of soil conservation in north Africa is striking. Heusch (1985) concludes that the large conservation programmes in Algeria, Morocco and Tunisia, from 1950 to 1975, were based on inappropriate technology imported from the totally different conditions of the United States, and the whole effort was a mistake which should not be repeated. Similar criticisms have been levelled at the GERES project in Burkina Faso. This umbrella term can include reduced tillage, minimum tillage, no-till, direct drill, mulch tillage, stubble-mulch farming, trash farming, strip tillage, plough-plant (for details see Mannering and Fenster 1983). In countries with advanced soil conservation programmes, particularly the USA and Australia, the concept of conservation tillage is the main theme of the recommendations for cropland, and it is also being taken up quickly in other areas, for example southern Brazil. The application is mainly in mechanized high production farming with good rainfall, or for the control of wind erosion where there is large-scale mechanized cereal production. It is less applicable to low input level crop production, or subsistence agriculture. · planting through surface mulches is not easy for ox-drawn planters although there may be no problem with hand jab planters. Surface manipulation such as ridging is discussed in Chapter 5. One of the reasons for low yields in semi-arid areas is the limited amount of moisture available to crop roots. 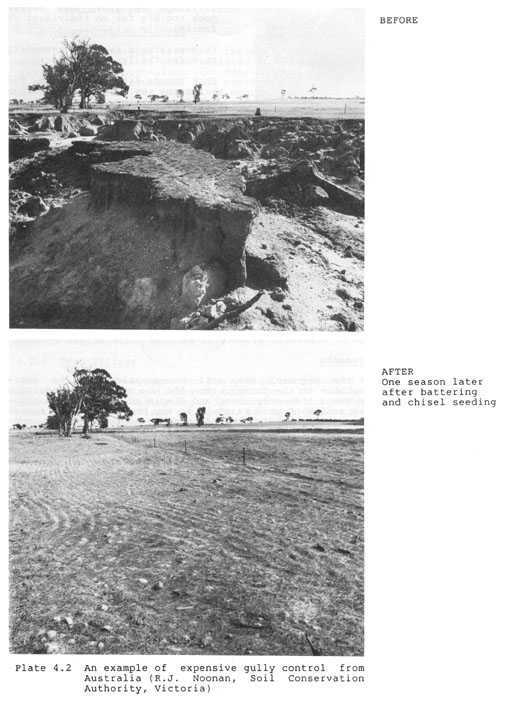 The available moisture will be increased if the rooting depth is increased and it has been shown that in some cases deep tillage can help, for example on the dense sandy soils (luvisols) in Botswana (Willcocks 1984). Reviewing many studies of experi- ments of depth of tillage on alfisols, El-Swaify finds varied results; deep tillage is beneficial for some crops but not all, and on some soils but not all. Also deep tillage requires greater draught power which is usually in short supply in semi-arid areas. Ripping or subsoiling can be beneficial, either to increase the porosity of the soil, or to break a pan which is reducing permeability. The deep placement of fertilizer can also be used to encourage more rooting at depth, but again the application of this technique to subsistence farming will be difficult. Like conservation tillage, this title covers many different farming techniques. It includes any farming practice which improves yield, or reliability, or decreases the inputs of labour or fertilizer, or anything else leading towards improved land husbandry, which we have defined as the foundation of good soil conservation. Sometimes there is a long history of traditional farming and soil conservation practices which have been tested and developed over periods of time which are long enough to include all the likely variations of climate. These traditional practices should give the best long-term result, bearing in mind that the farmer's interpretation of 'best' may be based on reliability rather than maximum yield. But the semi-arid areas are changing rapidly, and the traditional patterns may be no longer relevant. As Jones (1985) says "while tradition may incorporate the wisdom of centuries of practical experience, it may also be inappropriate where recent demographic pressures have already compelled changes - for instance, the abandonment of bush fallowing or migration onto different types of soil or into more arid areas. There is also the point that the agricultural scientist very often still lacks the recipe for certain success; and you cannot require farmers to adopt new practices that are only 50 percent successful." Possible new techniques should have the same basic characteristics as traditional practices, they should be easy to understand, simple to apply, have low inputs of labour or cash, and must show a high success rate i.e. a high rate of return. Farming on a rade is well established in India (Swaminathan 1982).Cultivations and planting are done on a gentle gradient, sometimes together with graded channel terraces. This encourages infiltration but permits surplus run-off at low velocities. Sometimes this may be combined with simple practices to encourage infiltration such as returning crop residues. This seldom provides a complete solution because of the problem of disposal of the surface run-off when it does occur. Strip cropping is most useful on gentle slopes, where it may reduce erosion to acceptable levels without any banks or drains. Rotations are another well established and simple practice. The object may be to improve fertility by the use of legumes or to help control pest or disease. In the semi-arid parts of Australia a successful practice is to alternate a cereal crop with a free seeding self-regenerating annual forage legume such as subterranean clover or medicago. Trials of adapting this system in Tunisia are reported by Doolette (1977). Fallowing is well established and successful in some circumstances but not others. In the drier wheat lands of Australia, a bare fallow in summer is used to build up soil moisture before sowing the winter wheat which receives only barely adequate rainfall. The practice is particularly useful on cracking clay soils. 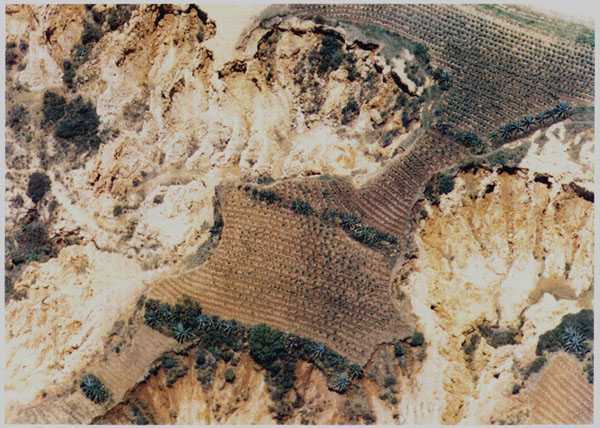 There is a risk of erosion taking place during the summer when high-intensity summer thunderstorms fall on the bare soil (Walker 1982). In East Africa, using this method on sloping land has a high risk of erosion (Pereira et al. 1958), but on gentler slopes in Botswana good results were reported by Whiteman (1975). The practice is not universally successful, partly because subsistence farmers may fail to keep the fallow completely free of weeds, and it is unlikely to appeal in uni-modal rainfall if the result will be twice as much grain half as often. In Syria, ICARDA studied the effect of fallows on moisture conservation in a barley/fallow rotation at six sites with annual rainfalls varying from 260 to 350 mm. At less than 260 mm there was no increase in stored moisture, and farmer-managed fallows had little effect up to 300 mm, but there was potential for increased moisture conservation when fallow land was well managed. This included thorough and deep cultivation of the fallow, good weed control and pest control, a nitrogen status able to make use of the increased moisture, and good seed-bed preparation (ICARDA 1982). Jones (1985) suggests that the best application of fallows might be a system of land management in which sequences of short and long-cycle crops and intervening bare fallows would be planned to optimize water use, since a full profile of stored moisture at planting time permits a crop to produce some yield even in the driest of years. 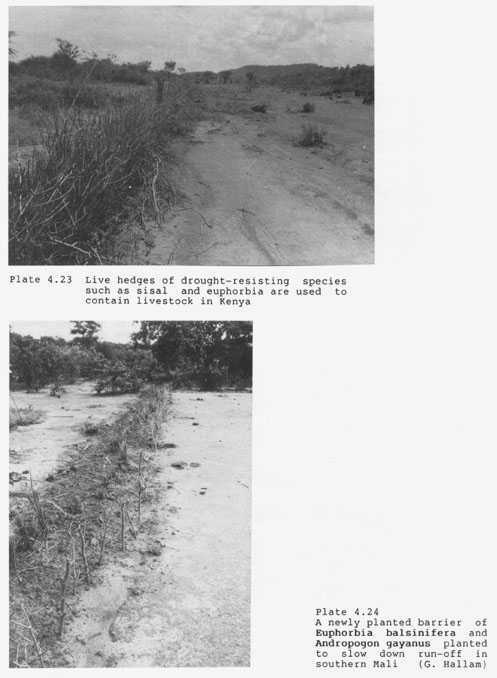 Boersma and Jackson (1977) report the long-practised successful use of summer fallows in semi-arid North America, and point out that a soil depth of one metre is necessary, and preferably 1.5 metres. On the other hand, trials in Israel by Rawitz et al. 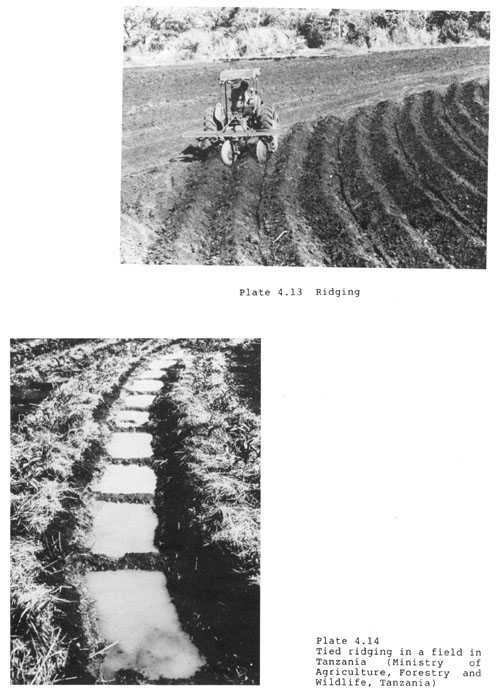 (1983) showed that the traditional tillage system of deep ploughing and further cultivations in autumn resulted in accelerated erosion and loss of up to 60 percent of the winter rainfall. Basin tillage was more effective, as discussed in Section 5.2.2. Reviewing the result of trials of fallowing in Francophone North Africa, Manichon (1983) concludes that the required conditions for it to work seldom apply in practice. Clearly this is a potentially useful technique but it must be tested in local conditions. Mixed cropping and interplanting are widely applied traditional techniques. A combination of crops with different planting times and different length of growth periods spreads the labour requirement of planting and of harvesting, and also allows mid-season change of plan according to the rain in the early part of the season (Swaminathan 1982). Another possible advantage may arise from the use of legumes to improve the nitrogen status for the cereal crop. Variations on the theme of mixed cropping, intercropping, and relay cropping are being investigated in the Farming Systems Programme at ICRISAT (1986). · organic mulches are liable to be rapidly oxidized in high temperatures. Successful use of mulching in the semi-arid south west of the USA is reported by Stuart et al. (1985). Trials of different materials and amounts are reported from India (Yadav 1974), and from the dry savanna of northern Ghana (Bonsu 1985). Timeliness of farming operations is always important, particularly where the rainfall is erratic, and yields can be dramatically affected by planting or cultivating at the right time. Common problems are having to wait for rain to soften the ground because it is too hard to plough when dry, and perhaps then not being able to plant because the ground is too wet. Or a family with only one ox having to wait to borrow another one - hence the interest in the one-ox plough shown in Plate 4.4. Or having to wait for a month after the rains start to get the oxen back into condition for ploughing after a hard dry season. The essence of Farming Systems Research is to look at the whole farming operation to identify the constraints or bottle-necks before starting component research on parts of the system. Some other techniques should be mentioned, but are beyond the scope of this book, so references are given for the interested reader. · Deep planting of varieties which can germinate from 15 cm deep, and so delay germination until good rains have fallen (New Mexico, Billy 1981), alternatively, soaking seed before planting when it is desirable to accelerate germination. 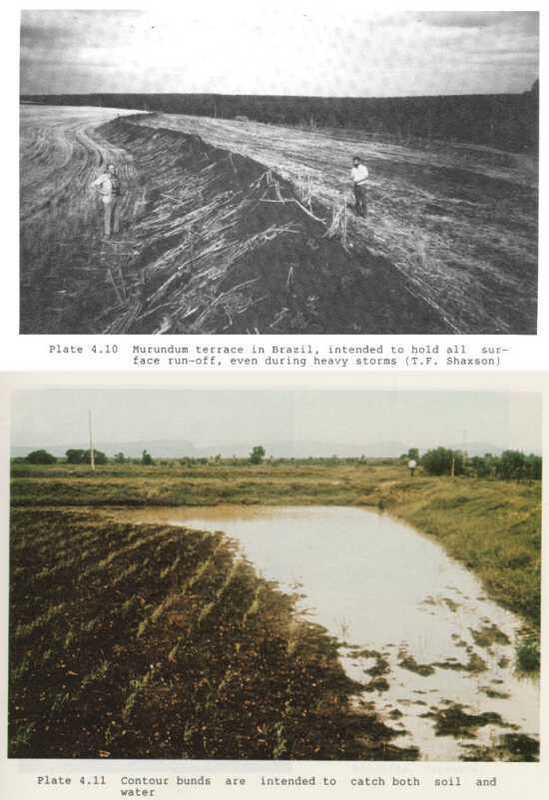 · Dry seeding where the onset of rains can be predicted (India, Virmani 1979). 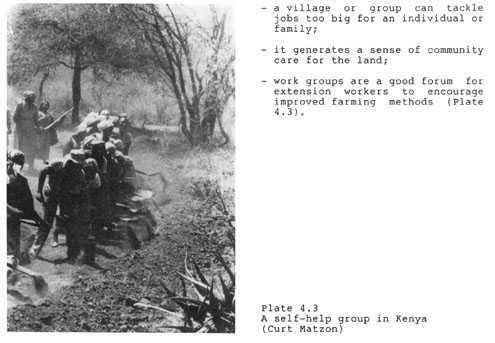 · Improved ox-drawn implements (Ethiopia, ILCA 1985. Kenya, Muchiri and Gichuki 1983). · Recent developments in tractor-drawn machinery (Australia, Charman 1985). · Tillage systems (USA, Wittmuss and Yazar 1981; world review, Unger 1984). The selection and testing of alternative crop varieties and, the selection and breeding of cultivars for semi-arid conditions is relatively new but shows promise (Oertli 1983). However, Jones (1985) warns that this solution will be neither easy nor simple because the main requirement is the ability to survive drought periods and start growing again when the drought is broken. This is controlled by a complex of little-understood attributes. Other desirable characteristics are a short growing season, drought resistance, and drought avoidance. The latter means the ability of the plant to adjust its growth habit according to the available moisture, for example, by tillering when moisture is available or going dormant when moisture is short, or only carrying through to ripening a proportion of the seed heads available. The uncertainty of crop production reduces the opportunity for the effective use of manures and mineral fertilizers. There are possibilities for economic returns for a small investment, for example "many semi-arid soils have a low sorption capacity for phosphate, which means that small additions are sufficient to give a substantial crop response and will usually have some residual effect for several years after. This is just as well, for little sustained increase in productivity will be possible in these areas without an improvement in phosphate ability." (Jones 1985). There is also evidence that the availability of potassium can improve water utilization through its effect on turgor pressure or the mechanism of stomatal regulation (Lindhauer 1983). Supplementary irrigation can be important because the provision of small quantities of water at critical times can have good results, for example to allow earlier planting, life-saving irrigation to carry crops through dry periods, or to increase the availability of soluble plant nutrients. There are no universal conservation practices that work everywhere. Planning soil conservation is like having a large array of techniques and practices set out each in a separate pigeonhole. The object of planning soil conservation is to make up a system by selecting a set of individual items which are each relevant to the conditions, and which can be combined into a workable system. Looking at the large choice of mechanical works, the main factor in deciding which to select must be to define the objective. The way that different terraces will help meet different objectives is set out in Table 4.1. · to allow the agricultural use of steep slopes (Type 8). In high rainfall areas a common objective is to lead unavoidable surface run-off safely off the land using drains and ditches. In semi-arid regions the objective is more likely to be to slow down the run-off to non- scouring velocities and to encourage infiltration or deposition of silt, without diverting the run-off. This requires simple low-cost structures quite different from the classical system of diversion drains, graded channel terraces, and disposal waterways. That is a high-technology layout of carefully designed structures, and the design procedures are set out in Hudson (1981). The approach is not suitable for semi-arid regions where it is unlikely that there will be suitably trained staff. Simpler techniques are required which can be laid out by village extension workers, or the farmers themselves. In developed countries a big soil conservation issue is whether the result justifies the cost. In the semi-arid areas this is complicated by the limited alternatives. A dispassionate scientific appraisal may say that some degraded land is best abandoned rather than trying to reclaim it with expensive soil conservation works, but if no better land is available for the production of needed food, then high-labour inputs may be acceptable as the only available option. There are several well-tested methods for laying out lines either on a level contour or on a predetermined gradient. The A-frame has been widely and successfully used in Africa and in South America, and so has the water tube. In Kenya the line level is preferred. These and other simple levell- ing devices have been compared by Collett and Boyd (1977). Where large areas of gently sloping land are to be laid out, a simple pendulum device can be mounted on a tractor and this has been successfully used in Northern Territory of Australia (Fitzgerald 1977). Whatever method is used to lay out the lines, it is a good idea to make a permanent mark if a tractor or oxen are available. The temporary markers used when laying out the lines are easily lost or disturbed if there is a delay between surveying and construction. 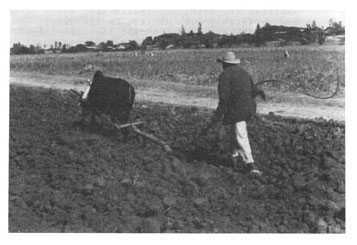 Also if channels or earth banks are going to be made by hand, the labour requirement can be reduced by ripping or ploughing by tractor or animals. Any system of lines, banks, or bunds on the contour has the import- ant by-product of encouraging cultivation on the contour. This alone can result in a reduction of run-off and soil loss of up to 50 percent. Of the types of terrace shown in Table 4.1, few are likely to have widespread application in semi-arid areas. 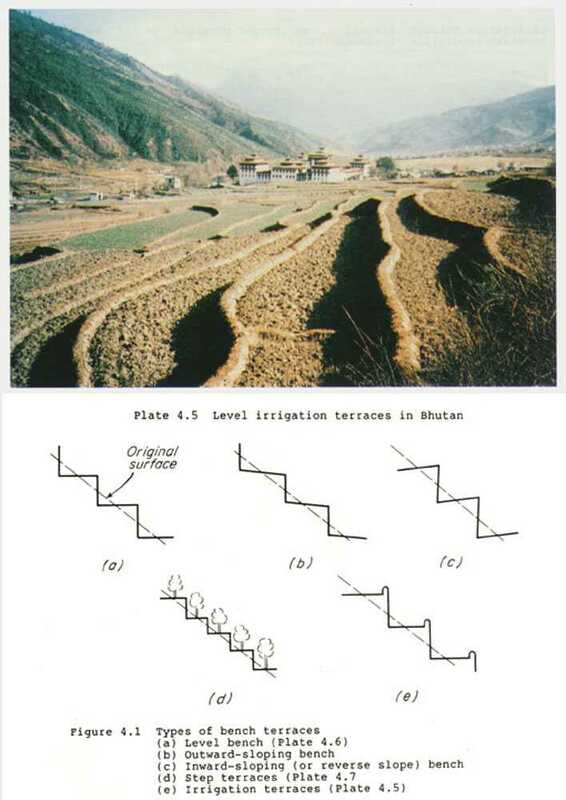 Level terraces may be appropri- ate where irrigation is available (Type 1), or intermittent level terraces (Type 8) used for run-off farming as described in Section 5.2.3. 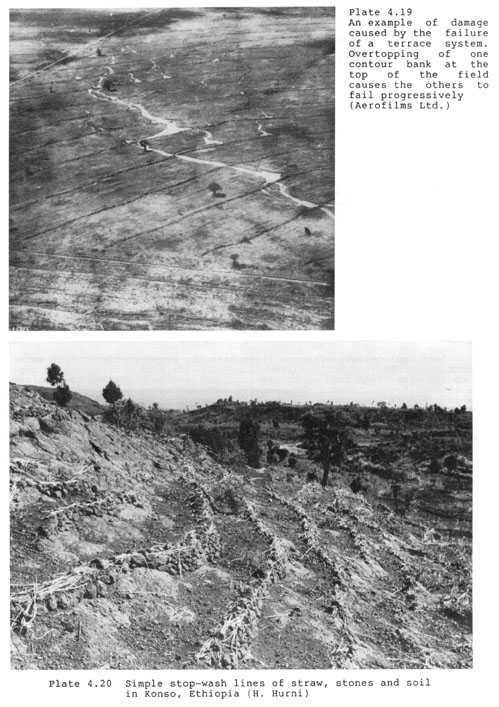 Fanya juu terraces (Type 3) offer a way of achieving level terraces by limited input of labour over a period of time (Figure 4.2). 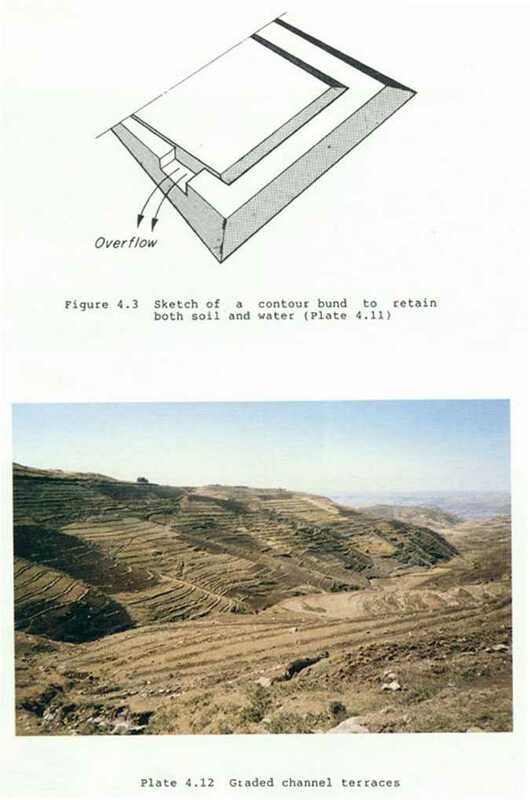 Contour bunds may be useful because of the dual purpose of conserving both soil and water,(Figure 4.3) and Plate 4.11. There may also be circumstances where a combination of shallow soils with limited storage capacity, and heavy rain, results in frequent surface run-off which calls for a system of graded channel terraces, either without storage (Type 6) or with some storage and a designed overflow. The problem is that any such system is likely to be expensive in relation to the productivity of the land, and it is difficult to maintain grassed waterways as disposal channels when rainfall is limited and unreliable. 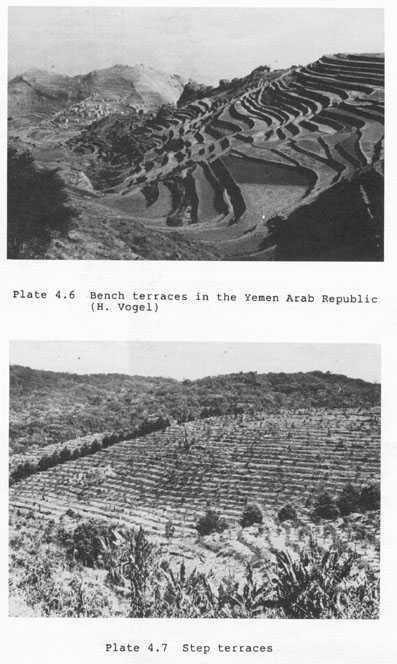 Level terraces for dryland farming (Type 2) have been extensively used in the past, for example Ethiopia (Plate 4.17), the Yemen Arab Republic, and in the Maghreb countries of North Africa (Algeria, Morocco, and Tunisia). Most were built in the past and nowadays are increasingly not maintained or abandoned as the maintenance becomes uneconomic or impossible because of labour shortages. One example is the Haraz mountains of the Yemen Arab Republic in the district of Manakhah (Plate 4.18). Until recently Haraz has been one of the most densely populated high-mountain regions in the world, with virtually all slopes being terraced or used as rainwater collection areas. Mainly since the end of 1970, large areas of this man-made ecosystem have been abandoned. In this district it is esti- mated that 800 000 males have migrated from the Yemen Arab Republic to jobs in the nearby oil states out of a population of between 5 and 7 million. Several similar examples are recorded on the north coast of Africa where the migration has been across the Mediterranean to Europe. We have seen that in semi-arid conditions it is seldom appropriate to divert surface run-off from arable lands, and the same arguments largely apply to cut-offs or diversion drains put in at the top edge of arable land in order to protect it from surface run-off from uncultivated higher land. There could be special circumstances, such as a shallow saturated soil which would be less damaged if water coming down from above could be diverted. The difficulty is that the drain may also divert run-off during gentle storms which might have been usefully absorbed by the arable land. The use of diversions will therefore be limited to cases where there is uncontrolled flood run-off in a channel or gully which will be wasted unless it is diverted to some useful purpose. This is discussed under run- off farming in Chapter 5. When there is a risk that any structure intended to gather run-off may be overtopped in heavy storms, it is important to deliberately provide planned overspills which can act as safety valves and make sure that the run-off is discharged in places where it will do least damage. The discussion of terracing and conventional conservation works clearly points to the use of simple and easily applied measures. The first of these should always be farming on the contour. This alone can reduce soil loss to approximately half of what it would be with cultivation up and down the slope. We have already seen that although rainfall in semi-arid areas will be less in total, it can still include very damaging storms, and so it will usually be beneficial to have some form of structure which will slow down the surface run-off, encourage the deposition of suspended mater- ial, and reduce the concentration of surface run-off in minor depressions. Structures on the contour are simpler and cheaper than graded channel terraces for three reasons. First there is no need to set them out on a precise gradient. They should be more or less on a level contour, but small errors are not as important as in the case of graded channel terra- ces. Secondly, where water is to be led off the land, then the spacing between the terraces has to be calculated, because each channel terrace has to handle the water from a given area. There is no point in using the design formulas when structures are either on a level contour, or are not intended to discharge run-off. If the object of structures on the contour is to store the total run-off then they must be designed to do this, as in the case with fanya juu terraces in Kenya (Thomas et al. 1980), or murun- dums in Brazil, discussed in Section 4.3.2. If the structures are perme- able or can be overtopped safely in heavy storms, then the distance between them is immaterial. Thirdly, since there is no attempt to lead water along the structure, there is no problem of trying to handle the discharge in drains or waterways. However, care is needed to avoid the danger of one level contour bank overtopping, and causing a progressive failure of all the lower banks, with the risk of starting gullies. Plate 4.19 shows such a case in Tanzania. A general term for simple structures on the contour is 'stop-wash lines' which correctly defines their purpose. The form of such lines will depend on what materials are available. On stony ground, using the stones to build rock lines serves the dual purpose of clearing them from the field as well as building the stop-wash lines. Where stones are not available, lines can be formed by piling up crop residues, perhaps with a few shovels of soil, and progressively built up later by adding weeds from hand hoeing. 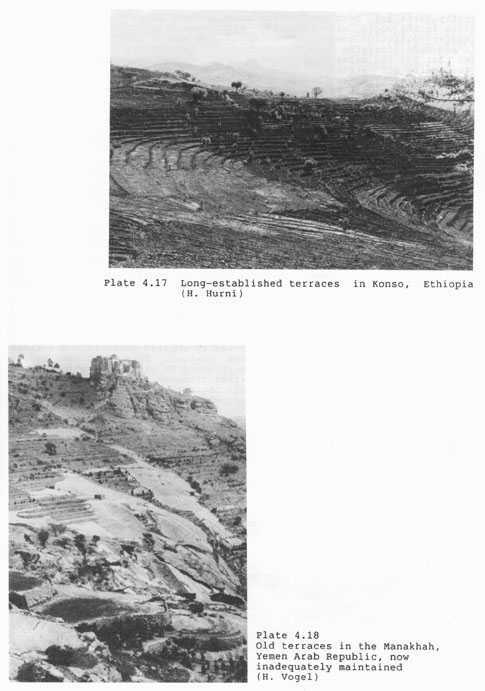 An example is shown from Ethiopia in Plate 4.20. No design is necessary, but the general principle is that there is not much point in building large or high structures, particularly if built from stone, since they will be very permeable, and in general a larger number of small barriers will be more effective than a small number of large structures. Grass strips can also be used as stop-wash lines, and this was the basis of a national conservation programme in Swaziland. In the 1940s the king issued a royal edict that strips of the indigenous grass were to be left on all ploughed land, 2 m wide at 2 m vertical interval. 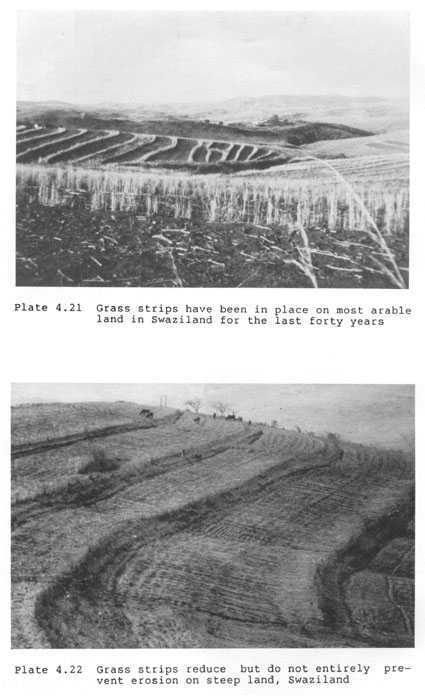 The rule was rigorously enforced and almost all arable land has grass strips today as shown in Plate 4.21. 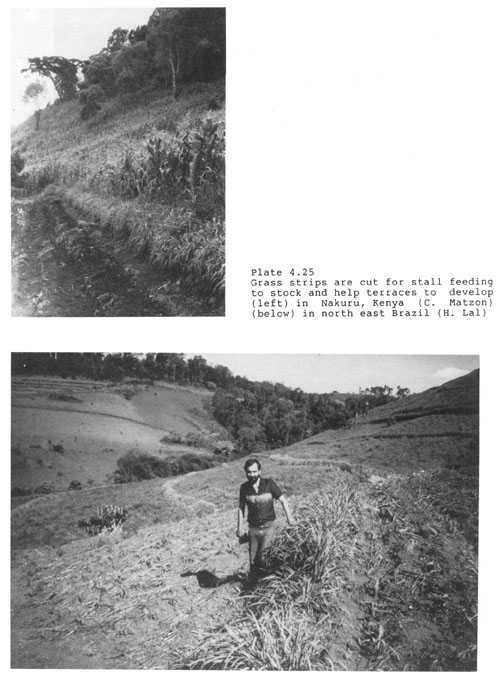 For lack of sufficient field advisors many of the strips were off-grade, and others were on land which is too steep for erosion to be halted by this method, as shown in Photo 4.22, but erosion in Swaziland would be very much worse if these strips had not been left. 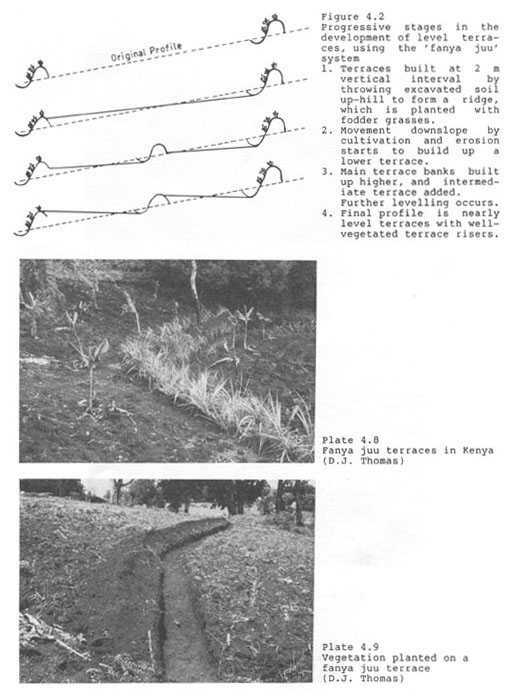 In Kenya live hedges are sometimes planted for the same purpose, often sisal, euphorbia, or other drought-resistant species (Photos 4.23 and 4.24). In areas with higher rainfall, grass may be densely planted to cut for fodder and cause a terracing effect (Photo 4.25). When stop-wash lines are intended to divert water out of small channels, it is desirable to reduce the permeability at this point. This is done using the principle of the reverse filter. The main structure is composed of large stones, then on the upstream side smaller stones are packed, but large enough so that they cannot be washed through the gaps in the large stones. Upstream of the small stones a layer of gravel is added. Water will still flow through the structure, but slowly, and it will build up in the depression and flow out on either side eventually finding a way through the rock barrier and continuing its path down the slope. This same principle can be used on a larger scale for gully control structures. Some applications of stone lines have the primary objective of water harvesting rather than soil conservation. Run-off from uncropped land hig- her up the slope runs down onto the cropland, and is spread by the perme- able stone lines along with the run-off which starts on the cropland. When this is the objective there will not be a diversion drain at the upper edge of the cropland, and the stone lines should not use the reverse filter. Where the object is to trap and hold sediment behind the stone bunds, and reduce the slope by developing terraces, the reverse filter effect is desirable along the whole length of the bunds if stones of different sizes are available. This demonstrates the principle that it is always important to be quite clear about the desired objective. Even a simple device like stone lines can be built to help them to remain permeable, or to silt up as quickly as possible, or to silt up in the depressions only -according to the objective. 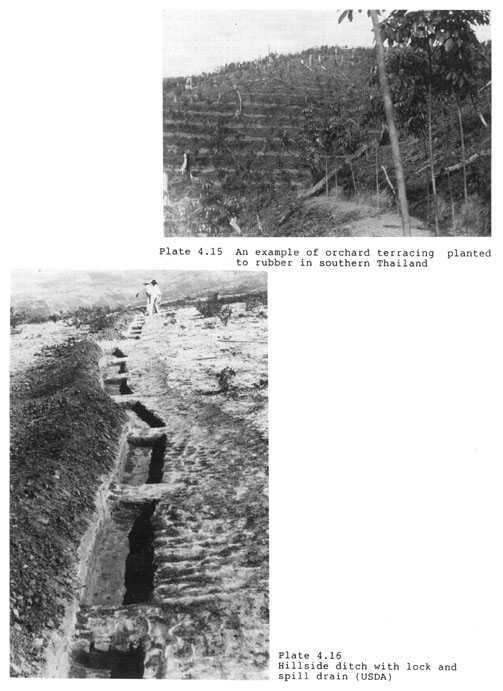 There are many examples of inappropriate and unsuccessful attempts to use graded channel terraces in semi-arid conditions (Heusch 1985; Roose and Piot 1984). There are also a number of examples of the successful use of small low-cost structures. 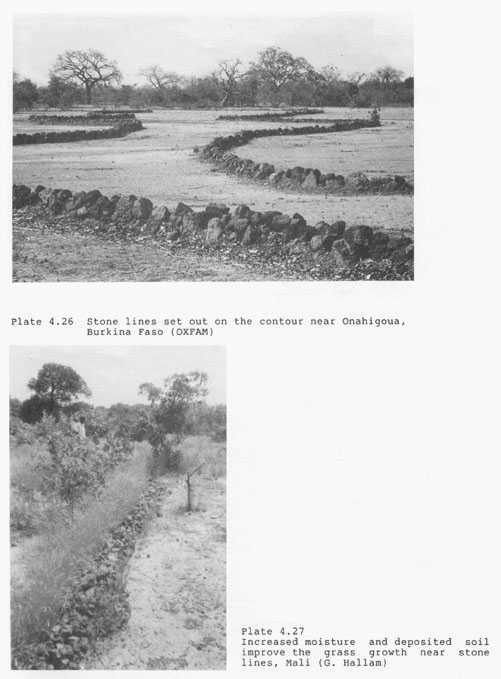 An example is the Mossi plateau in Burkina Faso where the recommended solution is to build frequent low barriers (20-40 cm high) at 10-25 m spacing, built of a basic structure of laterite blocks and stabilized with grass (Roose and Piot 1984). 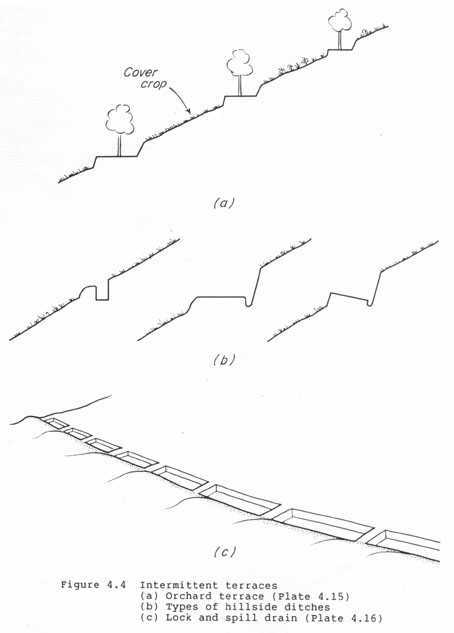 Another project in Burkina Faso used similar stone lines as illustrated in Plate 4.26 and described by Wright (1984), and the same approach was used successfully in Mali (Hallam et al. 1985; Hallam and Roose 1985). Plate 4.27 shows the effect on the vegetation of the moisture near a simple line of stones. 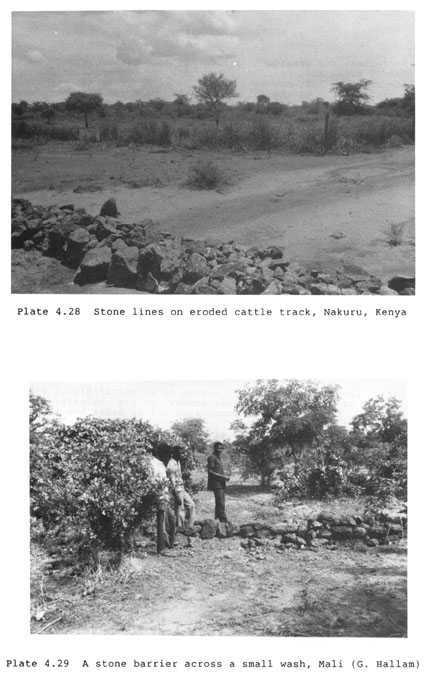 Plate 4.28 shows another application in the semi-arid south-east of Kenya, on an eroded cattle track, and Plate 4.29 a simple stone barrier across a small wash in Mali.